Scientists may not be able to tell a good book by its cover, but they now can tell the condition of an old book by its odor. 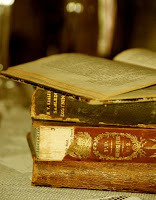 In a report published in the American Chemical Society's Analytical Chemistry, a semi-monthly journal, they describe development of a new test that can measure the degradation of old books and precious historical documents on the basis of their aroma. The non-destructive "sniff" test could help libraries and museums preserve a range of prized paper-based objects, some of which are degrading rapidly due to advancing age, the scientists say. Matija Strlič and colleagues note in the new study that the well-known musty smell of an old book, as readers leaf through the pages, is the result of hundreds of so-called volatile organic compounds (VOCs) released into the air from the paper. "The aroma of an old book is familiar to every user of a traditional library," the report notes. "A combination of grassy notes with a tang of acids and a hint of vanilla over an underlying mustiness, this unmistakable smell is as much a part of the book as its contents. It is the result of the several hundred VOCs off-gassing from paper and the object in general. The particular blend of compounds is a result of a network of degradation pathways and is dependent on the original composition of the object including paper substrate, applied media, and binding." Those substances hold clues to the paper's condition, they say. Conventional methods for analyzing library and archival materials involve removing samples of the document and then testing them with traditional laboratory equipment. But this approach involves damage to the document. The new technique — an approach called "material degradomics" — analyzes the gases emitted by old books and documents without altering the documents themselves. The scientists used it to "sniff" 72 historical papers from the 19th and 20th centuries. Some of the papers contained rosin (pine tar) and wood fiber, which are the most rapidly degrading types of paper found in old books. The scientists identified 15 VOCs that seem good candidates as markers to track the degradation of paper in order to optimize their preservation. The method also could help preserve other historic artifacts, they add.